Even with the stock paying a historically-high yield of 3.8% right now, a million-dollar portfolio at that yield would pay you just $38,000 a year. 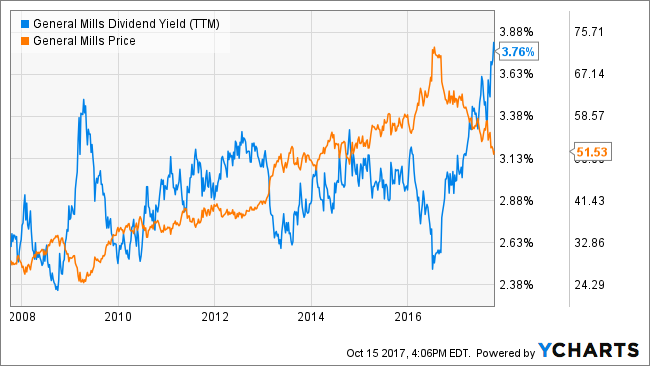 But what if you could make a high-yield trade right now with General Mills shares that boosts your income significantly — generating an annualized yield in the double-digits? 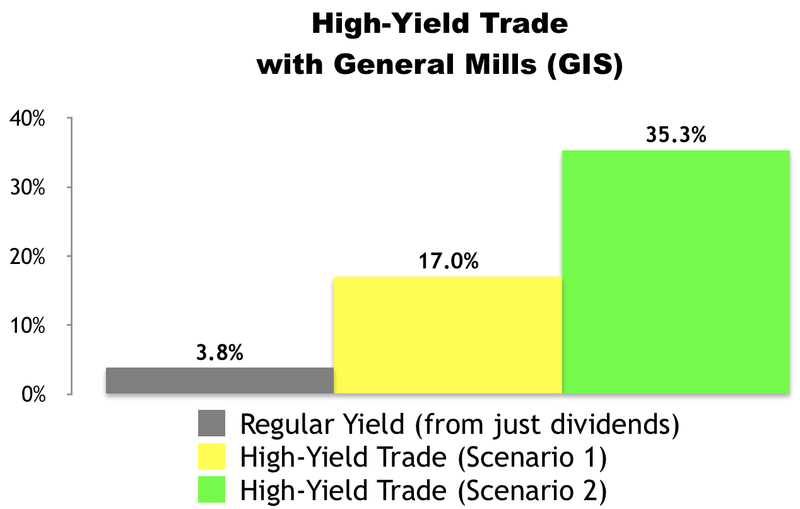 In fact, I just made one of these high-yield trades with General Mills this morning… and I’m generating a 17% to 35.3% annualized yield. Fundamentally, the stock looks attractively valued. There’s a lot going on in the FAST Graph below, but all you really need to know is that when the stock’s price (black line) is below its normal P/E (blue line) in multiple time frames, shares look relatively cheap. Note: I’m using the 10-year normal P/E in the chart below. Technically, while the stock is in a bear market (its 50-day moving average is below its 200-day moving average), it did just flash a “buy” signal on the MACD, which is a momentum indicator. With all of this in mind, a relatively short-term, high-yield trade like the one I detail below seems like a relatively safe, high-income move right now. As we go to press, GIS is selling for around $51.67 per share and the November 17 $52.50 calls are going for about $0.77 per share. Our trade would involve buying 200 shares of GIS and simultaneously selling two of those calls. By selling call options, we would be giving the buyer of the option the right, but not the obligation, to purchase our 200 shares at $52.50 per share (the “strike” price) anytime before November 17 (the contract “expiration” date). In exchange for that opportunity, the buyer of the option would be paying us $0.77 per share (the “premium”) per option. If GIS stays under $52.50 by November 17, our options contract would expire and we’d get to keep our 200 shares. In the process, we’d receive $154 in premium ($0.77 x 200 shares). Excluding commissions, if “Scenario 1″ plays out, we’d receive a 1.5% yield for selling the covered calls ($0.77 / $51.67) in 32 days. That works out to a 17.0% annualized yield. 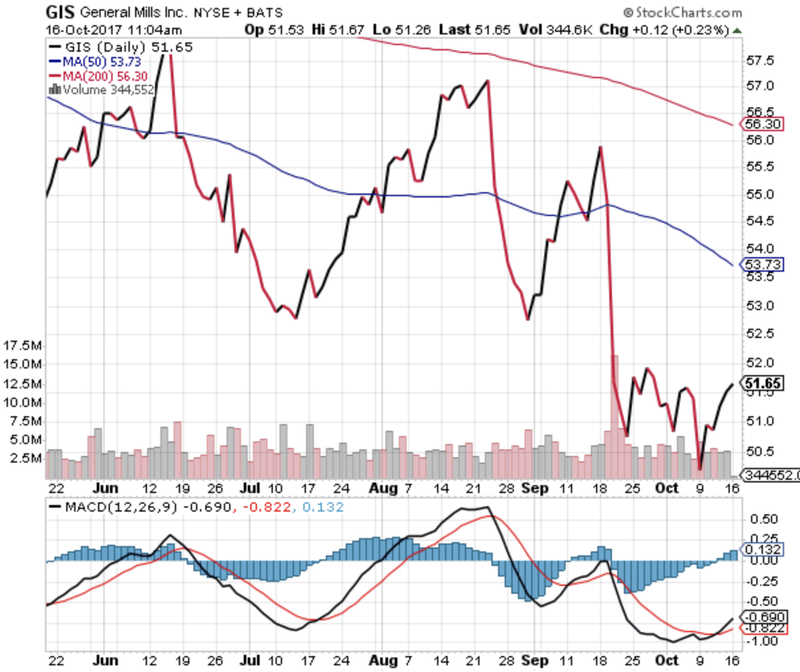 If GIS climbs over $52.50 by November17, our 200 shares will get sold (“called away”) at $52.50 per share. In “Scenario 2” — like “Scenario 1” — we’d collect an instant $154 in premium ($0.77 x 200 shares) when the trade opens. We’d then collect another $166 in capital gains ($0.83 x 200) when the trade closes because we’d be buying 200 shares at $51.67 and selling them at $52.50. In this scenario, excluding any commissions, we’d be looking at a $320 profit. From a percentage standpoint, this scenario would deliver an instant 1.5% yield for selling the covered calls ($0.77 / $51.67) and a 1.6% return from capital gains ($0.83 / $51.67). At the end of the day, we’d be looking at a 3.1% total return in 32 days, which works out to a 35.3% annualized yield from GIS. We’d place a “Buy-Write” options order with a Net Debit price of as close to $50.90 ($51.67 – $0.77) as we can get — the lower the better. 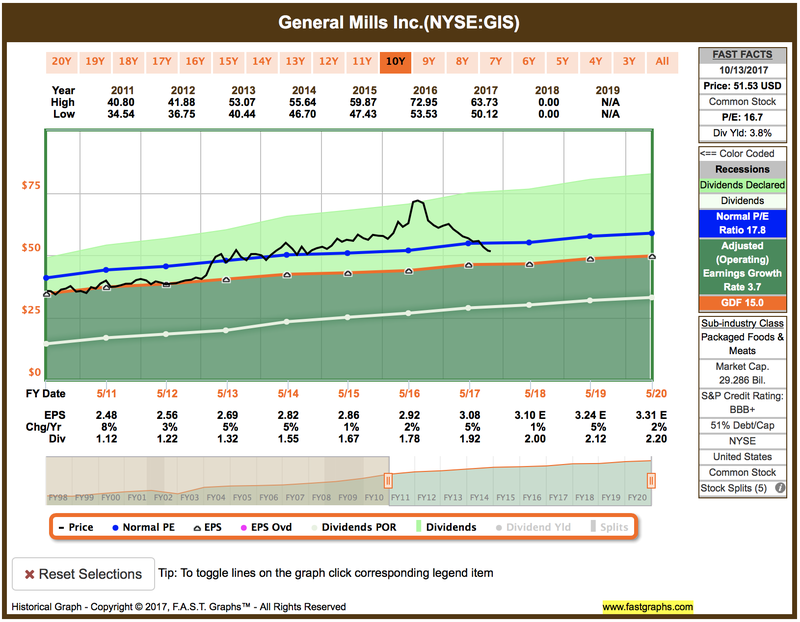 Options contracts work in 100-share blocks, so we’d have to buy at least 100 shares of General Mills (GIS) for this trade. For every 100 shares we’d buy, we’d “Sell to Open” one options contract using a limit order. I just made this trade with two options contracts, so the numbers in this article reflect that. Accounting for the $154 in premium we’d collect for selling two contracts, that would require a minimum investment of $10,180.